If you are looking for a unique September vacation, look no farther than Eureka Springs, Arkansas! As the weather cools, the town comes alive with one-of-a-kind activities and events. Plan your weekend escape to Eureka Springs today. The 47th Annual Antique Auto Festival in Eureka Springs, Arkansas will be held on September 8th & 9th, 2017 on the grounds of the Great Passion Play @ 935 Passion Play Road, Eureka Springs, AR 72632. The car show parade leaves the Great Passion Play Grounds at 4 pm and heads to downtown Eureka Springs. 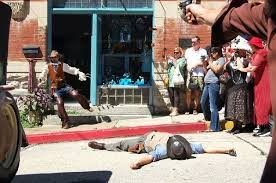 Immediately following the parade is the 1922 Great Bank Robbery Reenactment in downtown Eureka Springs. This is a local favorite! The 2018 Jazz Eureka Weekend offers free music in Basin Spring Park and jazz at other venues around town. This year’s festival will feature Jazz musicians Veronica Swift, Block Street Hot Club, Richard Bruton Quartet and more! Bikes, Blues & BBQ is coming to northwest Arkansas for it’s 19th year. Bikes, Blues and BBQ is the world’s largest charity motorcycle rally. Over the course of our 18 years, Bikes, Blues and BBQ has realized over $1.5 million to local charities.Eureka Springs is the perfect spot to stay if you love the rally lifestyle, but need a quiet place to relax when your day is done. Eureka Spring also offers many great motorcycle specials and packages. For a complete Eureka Springs Calendar of Events, CLICK HERE.